The new Ronald McDonald House Charities stamp set is proving to be very popular. Sprinkles of Life plus the matching punch can be used for trees, clouds, ice cream and more! 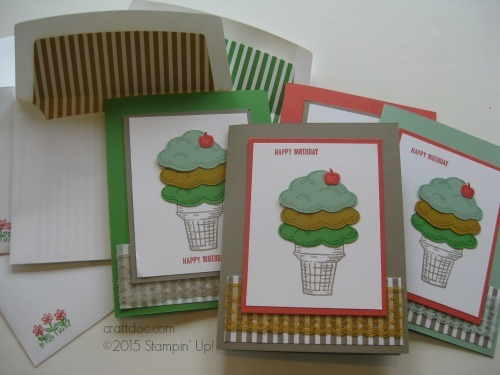 -Use the new envelope liner paper to line the envelopes and add a strip to the card. -Check out the new In Colors and matching ribbon. All supplies can be purchased at my website SHOP. If you are in the Erie, PA area, join us for the next Card Class on Tuesday. Details on my website calendar.